Postnatal depression (PND) is a condition that many women struggle with after the birth of a child. But surprising research suggests that up to 24% of men may be afflicted with PND, and that there is a strong correlation between PND in new mums and dads. A few weeks after their second son, Brandon, was born, Graeme Prentice called his wife, Aimee, and told her that he was coming home from work early - and he wasn't going back. "I was in a state of disbelief," Aimee recalls, her voice quiet and serious. "I asked him, 'Why?' and all he could tell me was that he needed a break." Aimee had noticed Graeme wasn't bonding with Brandon quite as well as he had with their first child, Micah, who was nearly three years old when his little brother arrived. Also, Graeme seemed withdrawn, antisocial and anxious. Even Aimee's parents had noticed that something wasn't quite right with their normally friendly and fun-loving son-in-law. The father of two simply wasn't himself, and, as soon as Graeme arrived home from work that day, Aimee made an appointment for him to see their GP. Graeme's GP diagnosed him with anxiety, which was attributed to the stress of having a new baby in the house combined with the fact he'd recently started a new and quite physically demanding job. Despite working only a 35-hour week, Graeme would come home every night exhausted. Brandon was a very unsettled baby, so the family wasn't sleeping well either - and it was really taking its toll on Graeme. He wasn't interested in confiding in Aimee, though, and kept his feelings bottled up, remaining withdrawn and avoiding his family and friends. His manager gave him a week-and-a-half off work with pay to try to sort himself out, and, when the time was up, Graeme returned to his job. But only another week or so after he went back, Aimee got the phone call that would change their family's lives. "When he called to say he was coming home early, my alarm bells started ringing," Aimee remembers. "Then when he got home, I had to beg him to see our doctor as I knew something was up. When I tried to tell him he had PND, he told me I was full of crap." "I didn't know what my problem was," Graeme explains. "I was angry for no reason at all. I didn't want to have anything to do with my family. I couldn't cope when I was in public or at work. I couldn't face the world any more; I was unable to leave home." Graeme finally consented to see their GP again, and the doctor confirmed Aimee's suspicions. Graeme was diagnosed with postnatal depression and acute anxiety. "I was almost hysterical, sitting in the doctor's waiting room for 45 minutes before the appointment," Graeme admits. After the diagnosis was confirmed, Graeme was prescribed antidepressants and referred to counselling, which, Aimee says, "helped enormously". "I was relieved to have an answer, and to have something to work towards overcoming," says Graeme. "Hitting rock bottom was a turning point for me." While postnatal depression in mothers first came to light in the 1950s, it was not until very recently that medical professionals started applying the same diagnosis to fathers. Research in the 1990s showed that some new fathers suffered similar symptoms to mothers with PND, but the actual medical diagnosis of PND in men is, even now, nowhere near as common as it is with women. Part of the reason for this is a lack of appropriate, gender-specific diagnostic criteria. A 2007 Danish article by Svend Madsen and Tina Juhl reported that, as measured by the Edinburgh Postnatal Depression Scale, an internationally used screening tool for diagnosing postnatal depression, the condition is shown to affect 10-14% of mothers. But according to the study, when using this same scale to evaluate men, paternal PND figures are all over the place - ranging from a low of 2% to a high of 24% of fathers. The study concluded that "better methods for identifying men with postnatal depression need to be developed". Using the same diagnostic tool to identify PND in both women and men may sound all right in theory, but, in practice, men are being overlooked. PND is overwhelmingly seen by society as a female-oriented condition. Pregnancy guides advise mums to watch out for symptoms of postnatal depression in themselves, and to seek help if they think they are affected. Husbands and partners are similarly counselled to be vigilant about their wives' mental health after the birth of a child, to encourage her to talk about her feelings and seek medical help if she isn't coping or feels depressed. For example, Armin Brott and Jennifer Ash's bestselling book The Expectant Father: Facts, Tips, and Advice for Dads-to-Be devotes only a single page to "Postpartum Blues and Depression", which is entirely geared toward informing the father of symptoms of PND in his partner. But on how men should deal with their own very real and very serious feelings and symptoms of depression, the books are curiously quiet. It's perfectly normal for one or both parents to feel, upon the birth of their child, high as a kite one day - and then lower than a piece of chewing gum (or worse) stuck to the bottom of someone's shoe the next. Mood swings are common for both mums and dads as they adjust to the havoc a new arrival can wreak on their schedule and their relationship (see "Keeping the spark alive" on page 84 for tips on dealing with this). Hormonal fluctuations in new mums can set everyone's nerves on edge, not to mention the relentless "feed-sleep-poop" schedule that defines those first several weeks of a baby's life and sends all other plans for normal existence right out the window. But postnatal depression isn't "perfectly normal", and if the new father has PND, it's often not easy for either partner to put their finger on what's wrong. Fathers may feel enormous pressure to "make everything better" and "hold it all together" while the mother of their child recovers from the birth and adjusts to the difficulties of feeding and caring for a newborn. Often the father is shunted to the side while visitors and relatives fawn over the mother and baby, which can leave him feeling ignored and underappreciated. And when it's the mother who is doing most of the day-to-day caregiving, especially if she is breastfeeding, fathers can feel inadequate - and may wonder, on some subconscious level, whether their family needs them for anything more than providing a pay cheque. Lonely and uncertain, feeling like a failure, it's understandable why new fathers can suffer from PND just as often as mothers do. 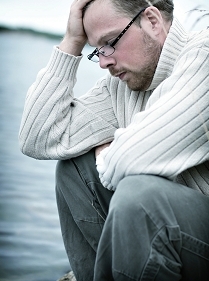 What are the signs and symptoms of PND in men? Similar to mums experiencing PND, feelings of depression, mood swings, and lethargy are prevalent for dads. Both women and men may feel they are not bonding with the new baby, and may resent its presence and be unreasonably frustrated or infuriated by its crying. They may feel they are merely "going through the motions" of caring for their child, without any emotional input. They may have difficulty sleeping despite their exhaustion, and become upset at the smallest things. They can't function "normally" as their thoughts are overwhelmed by feelings of self-doubt, guilt, and hopelessness, and they may have fears of harming themselves or the baby. They may lose their appetites as well, and feel like all of the pleasure has gone out of activities they used to enjoy. But certain gender-prevalent depressive symptoms have also been identified as occurring more often in men than in women, as Madsen and Juhl reported - symptoms such as anger attacks, inability or unwillingness to show affection, self-criticism, alcohol and drug abuse. These symptoms can also relate to PND in men, although they may not seem to be directly attributable to the pressures of new fatherhood. Graeme explains, "For me, the symptoms were anger, lying about my feelings, and secrecy. I underwent a complete change in my personality and habits." Because men are conditioned by society to keep a stiff upper lip and not talk about their feelings, it may be excruciatingly difficult to find out what's going on in his head. Research has shown that "talk therapy" is extremely beneficial for women with PND, but there is still societal stigma surrounding counselling among New Zealanders. Advertising campaigns such as the "Depression: There is a way through it" TV commercials featuring rugby hero John Kirwan have gone a long way in normalising depression, anxiety and other mental illnesses, but the average Kiwi bloke still baulks at the idea of talking to a stranger about his personal problems. Graeme's GP referred him to a counsellor, and he admits that it was hard going at first. "Talking to the counsellor was difficult until we built a rapport," he says. "Then it became easier to talk to him - about anything." Miserable mums = sad dads? "It took me a little while to realise I had PND too," says Aimee. "Several weeks after Graeme's diagnosis, I finally went to our doctor. He was not surprised to see me. He even said he had been wondering when I would crack under all of the pressure that had been placed on me." In 2004, John Condon and his colleagues noted that research has shown that another risk factor for male depression is having a wife with depression, postnatal or otherwise. All too often, the partner of a woman with PND is ignored or is expected to uphold unrealistic standards of support for his wife. While it's definately crucial for dads to encourage and support their partners to seek help if they have PND, it's equally important they don't neglect their own mental health. Aimee experienced PND with the birth of her first child, and had convinced herself that with the birth of her second, she would not be affected. When her husband was diagnosed with PND, she denied her own feelings of depression in an effort to try to hold everything together for her family and support Graeme. It's likely that this situation occurs more often than is realised, and that may be one of the reasons that men's postnatal depression is only now being recognised as legitimate. It's possible that in the past, men may have done what Aimee admitted to doing: quashed their own feelings in order to attend to their family. That makes it even more important for partners of women or men with PND to seek help if they, too, are feeling depressed. Postnatal depression can manifest itself very soon after the birth of a child, or several months later. When you're so focused on caring for someone else's needs and "being there" for someone, it's easy to overlook your own feelings until it's too late and depression has dragged you under. "There isn't a lot of advice I can give to mums whose partners have PND," Graeme says. "Just be open to seeing what's going on, and be there to pick up the pieces." So what can you do if you suspect your husband has PND? First of all, you need to take care of yourself. "The hardest thing was trying to stay afloat myself," Aimee admits. "I had PND after Micah was born and was so sure I wouldn't get it with Brandon. But the more depressed Graeme was, the more I could see myself heading down that road too." Researcher Christine Everingham and her colleagues, writing about couples' experiences of postnatal depression in 2006, cited research that indicated husbands and wives felt anxiety over their inability to communicate, which "may lead some fathers to withdraw from their involvement in their infant's care and perhaps become depressed themselves. The father's symptoms of PND may then go ignored". As Aimee says, "If you think your partner has PND, don't get in his face about it - but do try to get him to seek help. It's difficult, but your husband needs to be assessed by a professional in order to realise what's going on." • Learn about postnatal depression and psychosis, and the treatment options. Get information to help make sense of what has happened, and learn what to expect, so you can make informed choices about what is best for you. • Participate in decisions about your treatment. • Become familiar with any early warning signs of relapse, and be part of developing a plan for maintaining wellness. Health professionals involved in your care will help with this. • Receive treatment and support from people you trust, who expect the best for you and are able to accept how you are at any time. • Have the continuing support of family or whanau and friends, who know about the condition and understand what they can do to support your recovery. Practical support with running the house, child and baby care, and opportunities for time out are important. • Take the opportunity to recuperate - to sleep more if you need to, relax, and, after an acute episode, be encouraged to become active as you are able. • Take steps to improve your general health. If at all possible exercise each day, eat a healthy diet and have plenty of fluids- these will help you to recover and keep well. • Be realistic in what you expect of yourself, especially during the episode. When things seem too hard, take them on one step at a time. • Do something enjoyable each day, and try to focus on positive thoughts and memories. • Find the ways of coping that work best for you. These are different for each person, but are a critical first step on the path to recovery. • Avoid or really cut down the use of alcohol and illegal drugs, as these may worsen your condition and increase the chances of relapse. • Talk to your health professionals if you are considering stopping treatment and work together with them to find some compromise that will ensure continuing wellness but address your concerns about the treatment. If you are on medication, it is very important that the decision to stop taking it is made with the input of your doctor and anyone else involved in your treatment. • Condon, John T, Philip Boyce, and Carolyn J Corkindale. "The First-Time Fathers Study: A prospective study of the mental health and wellbeing of men during the transition to parenthood." 38 (2004): 56-64. • Everingham, Christine Rosemary, Gaynor Heading, and Linda Connor. "Couples' experiences of postnatal depression: A framing analysis of cultural identity, gender and communication." 62 (2006): 1745-56. • Madsen, Svend Aafe and Tina Juhl. "Paternal depression in the postnatal period assessed with traditional and male depression scales." 4:1 (March 2007): 26-31. Find inspiration with a peek inside five of our favourite lunchboxes.